A Cherry Blossom in Chiang Mai, for real? Oh yes, it is. Cherry Blossom Aka Sakura is no longer reserved only for Japan. Its spectacular blooming scenery can also be seen in the North of Thailand. The wild cherry blossom trees here grow on verdant high mountains across northern region during December to February, attracting a number of tourists to enjoy the northern delights during the cool season and as a celebration of new year for the Thais. Thai and Japanese Sakuras are different in blooming period and size – Thai Sakura comes during December to February which is the cool season, while the Japanese Sakura, with bigger flower and more color density, exposes its flowers during April to May to welcome the spring season, a fresh start leaving the cold winter behind. 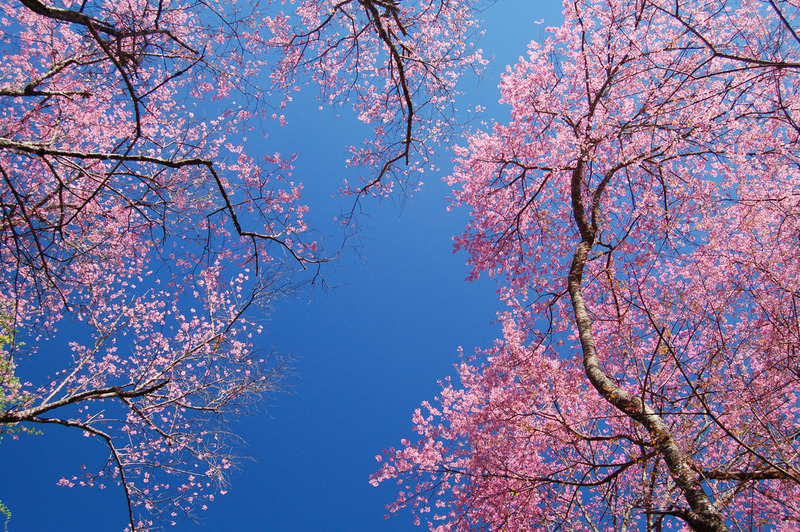 What both Cherry Blossoms of the two nations shared in common is – the celebration of happiness and new beginning. Thai Sakura is the Wild Himalayan cherry blossom species (Prunus cerasoides). Its name in Thai is “Naang phá-yaa suea-khrông”, which means “Tiger Queen”. It originally blooms from Himalayan Mountains and widely spread into mountainous territories of northern Thailand namely Chiang Mai, Chiang Rai, Loei, Nan and Mae Hong Son provinces. The most famous and closet day-trip spot to see the pink petals would be “Baan Khun Chang Khian” (Khun Chang Kian Highland Agriculture Research Center), a tiny village way up on Doi Pui mountain in Chiang Mai city. Chiang Mai’s breathtaking Cherry Blossom trees can be viewed in the gardens of Baan Khun Chang Khian, an ideal place for a romantic promenade. There are a lot more to see and feel in Bann Khun Chang Khiang, including Coffee Arabica plantation, flower and temperate fruit gardens, the Hmong tribe’s way of life in the small Hmong village and the cool fresh breeze that purifies your senses. Sabai-arom bottles all that liveliness and sensuous floral scents of Thai Sakura into Chiang Mai Cherry Blossom collection, enlivening you to always look forward to seeing those beautiful pink petals again—and again. 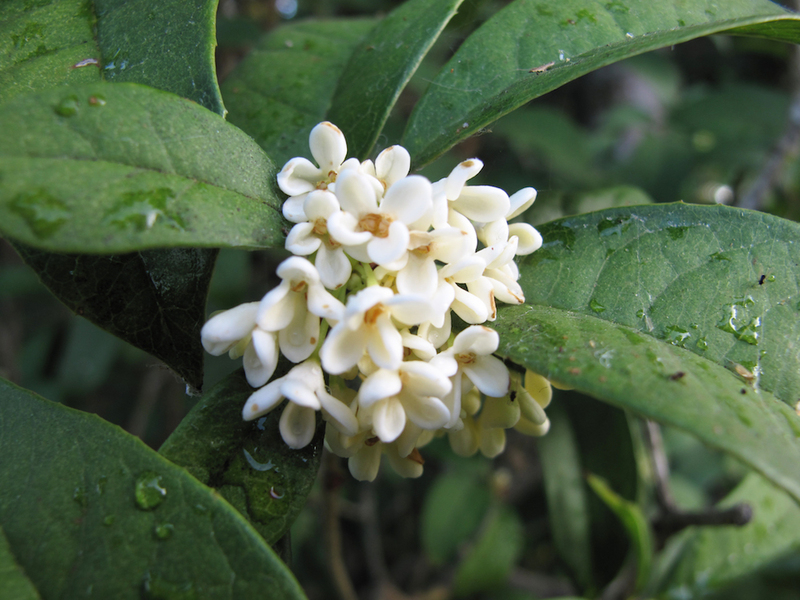 Our jasmine flowers are native to Thailand. They belong to Jasmine sambuc family and are called ‘Ma-li-la’ jasmine. The Ma-li-la jasmines we used for this collection are from Nakhon Chaisri district in Nakhon Pratom province, which is Thailand’s best jasmine source that produces high quality jasmine flowers with big petals, long stalks and magnificently sweet scent—owing to highly-fertile loose soil. We used chemical-free Jasmine flowers form this best source to extract the best skin hydrating benefit and scent our ‘Jasmine Ritual’ collection with a calming and mind-soothing sensory of Ma-li-la jasmine, tenderly handpicked very early in the morning when the floral fragrance is potent. We met Khun Buum, the friendly jasmine farm owner, whose whole life has been associated with jasmine flowers. Khun Buum and her co-workers always start their day early in the morning by handpicking, assuring quality and packing jasmine flowers before transporting to Paklong Talaad, the biggest flower market in Bangkok. 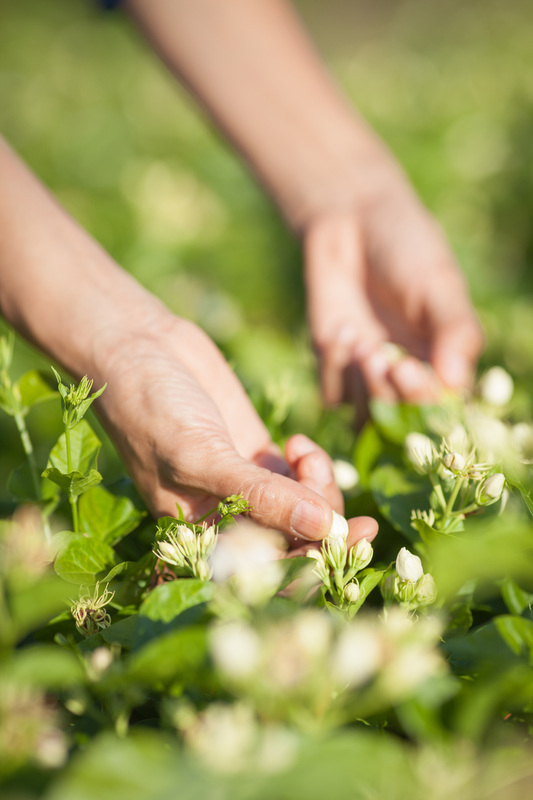 Having had a chance to handpick jasmine flower by flower, we realized that the flowers had to be truly handled with delicate care. Jasmine flowers are always on high market demands. They significantly impel the floral business of the country, fostering many lives attached to it in a sustainable way. Being a flower of faith that reflects the important role in Thai way of life spiritually and economically, we chose Ma-li-la jasmine, as the flower of Thai life, to represent the collection of divinity and blissfulness and the simple of happiness of who live their lives with these tiny white flowers. 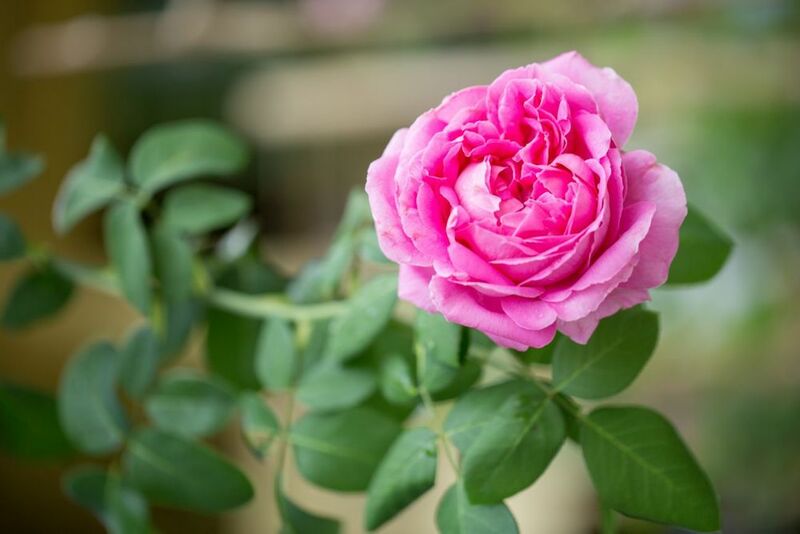 Chulalongkorn rose is a hybrid perpetual thorn-free pink rose originating in 1867 in England. It blooms a big pink flower that reaches up to 15 cm in size and diffuses a remarkably loving scent. This vintage rose was primarily cultivated in Chiang Mai by Princess Dara Rasamee with her very first intention to lay the foundation of commercial-based rose cultivation in the north of Thailand. We traveled up north to Darabhirom Palace in Chiang Mai province, the capital of northern Thailand with numerous cultural heritages, to discover a love story between King Chulalongkorn of Siam and the Princess Dara Rasamee of Chiang Mai. As an avid member of The Royal National Rose Society (RNSS), Princess Dara Rasamee had obtained new rose species every year. Among many roses, there was one large pink thorn-free rose with a characteristic fragrance, which became her favorite flower. She named the rose ‘Chulalongkorn’ and cultivated her rose around her residence on Mae-rim hill in Chiang Mai and handpicked her rose every day to put it before her husband’s image to show her loyalty—until her final day. True Love lives forever even if we are physically apart; that’s what Sabai-arom feels for this romance tale, and the princess of Chiang Mai had already portrayed the idealism in her own way. We used Chulalongkorn rose essential oil for its delicate fragrance that imparts the scent of romance and endless love of two royal hearts. Being a useful plant that’s easy to grow and requires no special care, lemongrass is a must-have item for the Thai homegrown gardens. 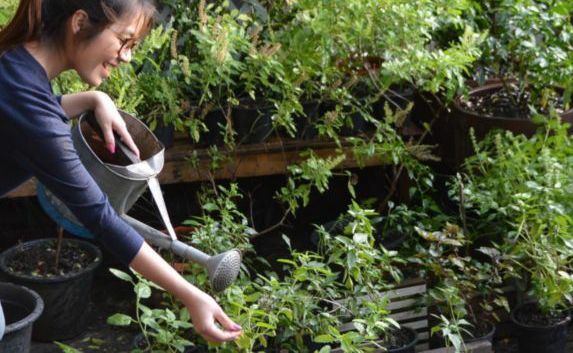 We set a little expedition to houses in Bangkok to explore the homegrown garden of city people and were surprised of how they had made lemongrass as their very first choice to fill their little gardens. With limited space to grow plant, one bush of lemongrass is more than worth for them, thinking how this scented plant can go as ingredient into many Thai dishes and also provides medicinal benefits. The traditional Thai medicine uses lemongrass for its broad spectrum antibacterial properties. This inspires Sabai-arom to create something wonderful out of lemongrass. We combined its pure essential oil with extracts from many Thai herbs that also provide antibacterial characteristics and made an effective refreshing formula to protect skin, while delivering heady-citrus blend of lemongrass that energizes and soothes. Are you thinking of your own lemongrass yet? Samui’s certified organic virgin coconut oil is derived from fresh organic island coconuts, which are big in size and contain high content of vitamin E and lauric acid. The islanders pick their ready-to-take coconuts with the helping hands of monkeys. They would remove the husk, scratch coconut flesh and press coconut milk, and then leave for about 8 hours to allow the virgin coconut oil to separate its layer from coconut milk. All processes are entirely hand-made without using heavy machine and heat. The processed coconut oil is, thus, virgin and fully filled with great skin nutrients straight from nature. Being Thailand’s second-largest island after Phuket with white sandy beaches, coral reefs and natural resources, Samui, long before it became very famous among the tourists all over the world, was known as ‘Coconut Island’ for it had relied much on coconuts to drive the local economic. Owing to the good weather and abundant soil, Sami’s coconut trees are incredibly tall. 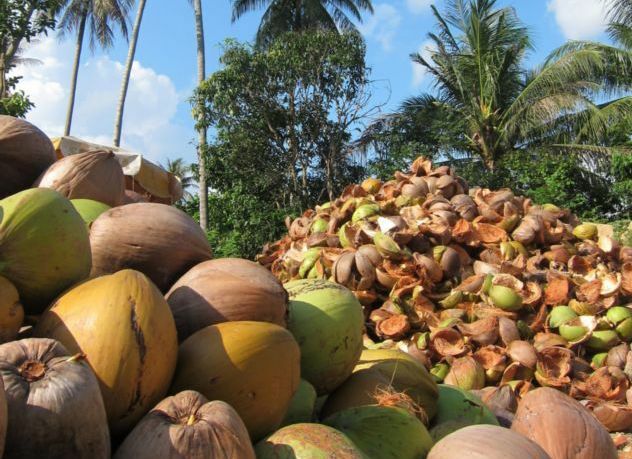 The Samui islanders produce virgin coconut oil for internal use without heavy machine responding their extensive needs in consuming this nutrient-rich oil as main food ingredients, as natural skincare and as part of medicinal recipes. They also sell their homemade virgin coconut oil and coconut products to the tourists visiting their happy island. Many years back then all the Samui families owned a coconut garden. Their coconuts were distributed throughout the nation. The story of tourism on the island began with the very first groups tourists that journeyed to Samui and were welcomed by the locals with heartfelt hospitality; a beginning of the big talk in the global tourism industry. However, the latter massive invasion of luxury hotels to the island made the locals sell their land plots extensively and became the hotel employees. Today, only the middle and southern parts of the island are left for coconut plantations. We realized that local identity tells the pride of the locals, that’s why we traveled to Samui Island to be even a small part to support and lift the pride of the small of group of happy people, who are still making high quality virgin coconut oil. Sabai-Arom fairly sourced Samui virgin coconut oil to partly help the locals in remaining their legendary treasured drops for long. Our Jasmine Infusion Collection sets its journey to a hideaway tea plantation on mountaintop in Mae Hong Son province, located in the northern border that separates Thailand from Burma. Mae Hong Son is known as “The City of Three Mists” from the fact that it has dewy mist in the winter, forest fire mist in the summer and rainy mist in the rainy season. The inspired sensory is the reminiscence of a small village nestled up at the top of Mae Hong Son province called “Mae Aw” which is famous for its breathtaking views and tea cultivation. The villagers are mainly refugees fleeing from southern China during the regime change, who had drifted in northern parts of Thailand and previously made a living by growing opium for drug trade. With the royal patronage of His Majesty King Bhumipol Adulyadej, they were given a Thai citizenship and a beautiful land to settle for life and also introduced means of support to improve their standards of living. Instead of opium they began to cultivate high quality tea varieties such as Oolong, which is their long-rooted wisdom passed down from China. A grateful love and loyalty of the villagers for the king can be primarily seen from the Thai king portraits hung in their traditional clay houses. “Mae Aw” today is a popular tourist destination for both Thais and Foreigners to experience the combination of Thai-Yunnan culture and its beautiful Tea plantations. We take you away from the hectic city life to the mountainous hideaway of Mae Hong Son. Jasmine Infusion Collection is created from the blend of Oolong Tea and Jasmine sensory, reminiscence sipping Jasmine tea looking over the verdant tea plantations. Discover our heartwarming scents collection that will immerse your senses into the charm of northern Thailand. Come away with us! In the old days this land of smiles was abundantly blessed with many colorful and beautifully scented flowers that allowed the Siamese Ladies to create their own fragrance recipes using the sensuality of those Thai flowers and inspire the poets to deeply describe their dearly beloved women to their glamorous scents. However, the important role of Thai fragrance recipes had shrunk since the arrival of western perfumes and rapidly faded away from the memory of people of the new generation. We wondered if the Thais would still embrace their local flowes. To answer our curiosity we set out a floral expedition in the neighboring areas. Surprisingly, we found out that more we walked the more we saw local Thai flowers, planted decoratively on the fence of houses and buildings. Some even grew wild. We asked for a permission to pick those flowers a small handful and went back to our office. And the edge result of that day came right onto the label of this collection including the flowers of Ylang Ylang (Gradang-Nga), Champaca (Chumpa), Bulletwood (Pikul), Ironwood (Boonnak), Lotus (Bua-Luang) and Malila Jasmine. All diffused sensually trying to win a place in our hearts. 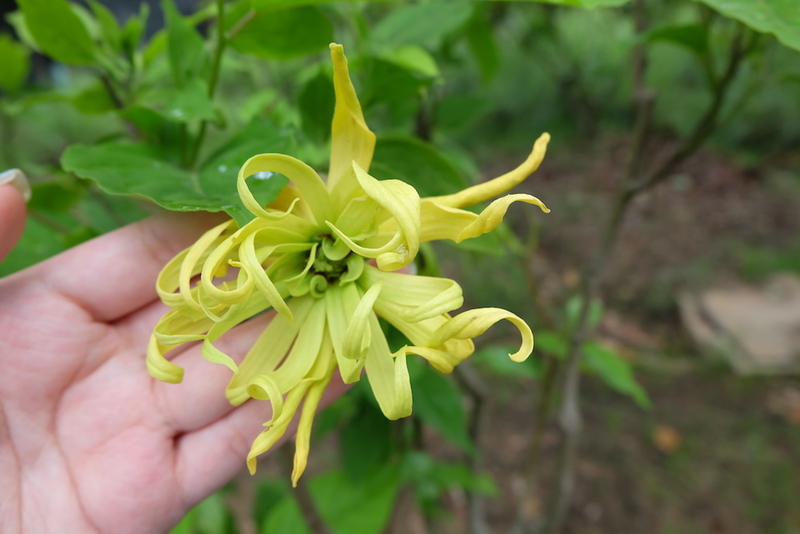 This Thai flower expedition made us realize that the ‘happiness’ was so near, but we just have to take a look a little closer, and we would find it right there. Have you already started to look for a simple happiness lying within your reach? The iconic ‘Phuket Pineapple’ was registered on the list of ‘Geographical Identity’ or ‘GI’ products by the Department of Intellectual Property, won by its uniqueness, particular cultivation area and expertise of the farmers—adding another wonderful thing to this famous island and bringing pride to the locals. 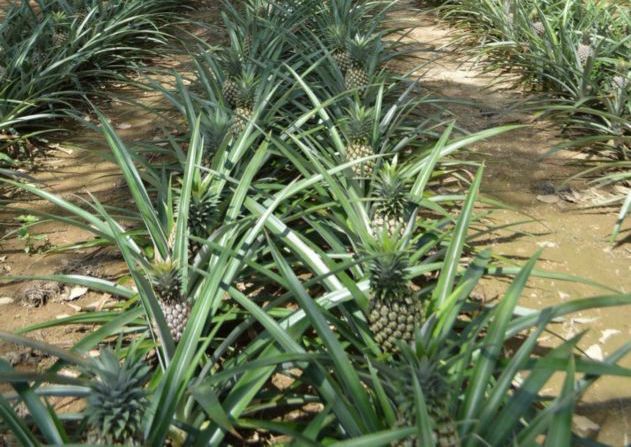 Patience is certainly required for Phuket pineapple cultivation as it takes up to 1.5-2 years to harvest, while one bush gives only one fruit. Phuket pineapple gained the popularity for its extra-size fruit, crisp, sweet taste, smooth yellow flesh and small core that makes it possible to eat almost through to the center. It also provides Fruit Enzyme (Bromelain), AHA, and high content of vitamin A and C that gently that replenish and brighten skin. We had a lovely talk with Khun Wichai or Go Chai, a Phuket pineapple farmer. We visited two of his chemical-free pineapple farms. There, we tasted a very toothsome Phuket pineapple at source. 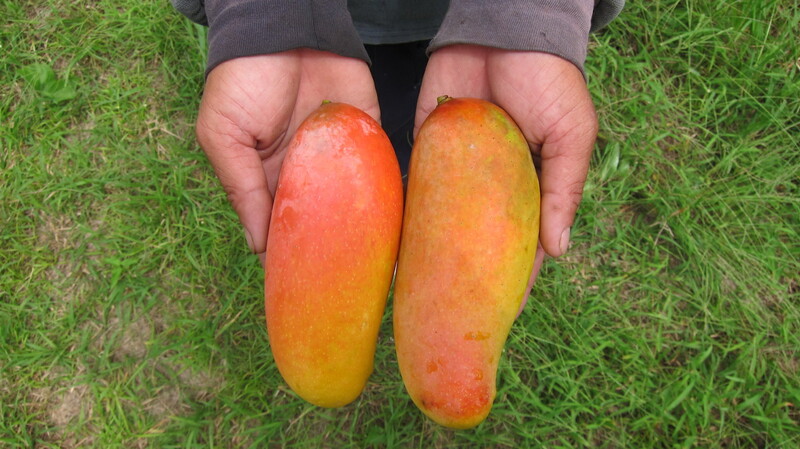 With his 22 year of wisdom and planting experiences, Go Chai told us that his ancestors had made a living by planting Phuket pineapple, and inherited the planting knowledge from generation to generation. He cares for the customer’s well being just like he cares for his own; so, his pineapple is grown chemical-free. Go Chai loves his farming life so he attends to it with passion and never wants to do something else.